Something about the Holidays and trains…..
As a photographer, I’m drawn to details (or as someone keen on details I’m drawn to photography?) and amidst 1,500 miles of Christmas holiday auto travel, my family managed a detour to the Carnegie Science Museum in Pittsburgh. And while these images have nothing to do with my regular photography pursuits, they hopefully appeal to that innate kid in all of us…. the detail is quite remarkable, but easily overlooked. 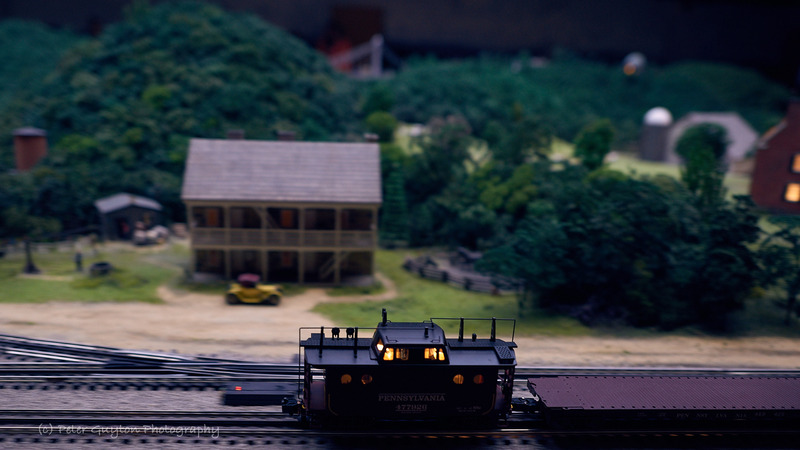 It’s hard to fathom the size of this miniature railroad and village….. as calling it a “train set” would be equivalent to calling New York City a hamlet. Like a pond, one could easily walk past and miss all that’s going on; it’s just a quiet body of water until you stare long enough to notice tadpoles, tiny fish, lilly pads, dragonflies, and frogs. 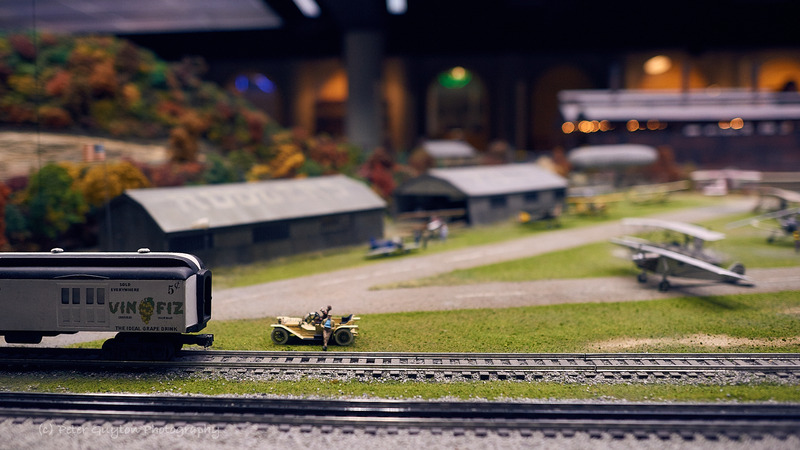 Similarly, in this little train universe, circa late 1930s, details are there to be discovered as well…. if you slow down and take a look. For instance, as a caboose cruises by, you can almost not help but imagine one of the conductors drinking coffee as a farm’s silo passes in the distance. Next to the airport, a gentlemen reads a newspaper while leaning against his car. What’s he waiting for? What’s in the news? 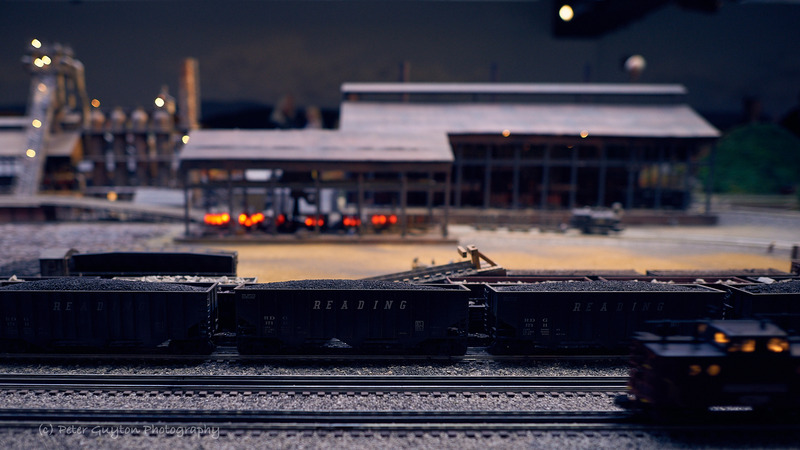 And near the Sharon Steel Mill, coal cars sit waiting to unload the raw materials for the steel which would build much of America. At the far end of the display a crowd at a small train station awaits the arrival of a passenger train. And a woman dressed in her Sunday best emerges from a house as a diesel locomotive approaches and an oil delivery truck passes on a nearby street. To the right someone emerges from a shed. The one detail that impressed me most went unnoticed until I got home and zoomed in on my computer. Here’s an image of Forbes field in the center of the display’s village. There are 23,000 fans in the stands and a player is running toward second base. … actually, he’s not running but diving in what appears to be an attempt to steal second; his feet point up to the sky, his hands the only body parts touching the ground. The umpire standing behind is studying the base, preparing to make the call. Anyway, I’m sure there are other huge miniature train displays out there (a train aficionado I’m not), but anyone can appreciate the effort and time that went into this little universe; especially in a society where so much is “instant” and where “taking a step back” to absorb detail is a luxury rarely afforded or taken. Alas, my family had to move having only touched the surface; for instance I learned afterwards that I missed Punxsutawney Phil at Gobbler’s Knob and tons of other details (e.g, there are over 250,000 trees, 85 automobiles and 22 horse-drawn vehicles and 105 animations). But if you are in Pittsburgh sometime, check it out the Carnegie Science Center, the kid in you will be sure to emerge if you just take the time. 1 response to Now THAT’S a train set! WOW! What an impressive layout!